Félix Lope de Vega y Carpio (1562-1635) was Spain's greatest playwright (he's often called "the Shakespeare of Spanish literature") and his two-storey brick town house uphill from the Paseo del Prado is located on a street named after his contemporary and adversary Cervantes, the country's most famous novelist. Lope de Vega started writing at age 12 and completed close to 2000 plays (a number never beaten by anyone else). 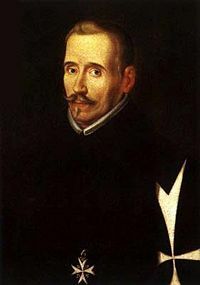 He was a rather controversial figure in his time, having been banished from Madrid for eight years for having written insulting poems about his former girlfriend (the daughter of an important businessman), who had abandoned him for a wealthy lover. He then lived in this building from 1610 until his death in 1635, and a visit to this now house-museum provides an overview of everyday life during Spain's Golden Age in the 17th century. It is a trip back in time, with the rooms displaying period furniture among other interesting features such as whale-oil lamps and pans used to warm the bedsheets. The delightful gardens in the back contain the same ancient fruit trees described in the writer's journals, as well as an interesting well, and should not be missed. Over the entrance, look for an inscription in Latin, "parva propia magna, magna aliena parva" that translates approximately to "what little I have is much, what much others have is little". An informative tour (also available in English) makes a visit much more interesting.